WASHINGTON (Reuters) - When President Donald Trump announced on Oct. 12 he would stop subsidies to health insurers critical to the Obamacare law, the response from Democratic state officials was swift and predictable: a lawsuit by 18 state attorneys general was filed within 24 hours. The race to the courthouse in response to presidential actions has become a familiar pattern since Trump took office in January, and early rulings in many of the lawsuits have, at least temporarily, hobbled key parts of the president’s agenda. Many of the Republican president’s most significant executive actions, in areas from immigration and transgender rights to energy and the environment, have been impeded by court rulings in cases brought by Democratic state and local officials as well as liberal advocacy groups. “We are more of a check on this administration than Congress,” Democratic New York state Attorney General Eric Schneiderman said of state attorneys general. Similarly, important executive actions taken by Trump’s Democratic predecessor Barack Obama were stymied by lawsuits filed by Republican state attorneys general, including one eventually decided by the Supreme Court that was intended to protect millions of immigrants in the country illegally from deportation. Trump has claimed some court victories, too, including on Oct. 25 when a federal judge in California refused the request by the state attorneys general to force the government to keep the subsidies to insurers under Obamacare, formally known as the Affordable Care Act, in place as the litigation proceeds. That decision was more the exception than the rule. "President Trump remains committed to protecting our national security and to eliminating excessive regulations that, if implemented, would destroy jobs, harm consumers and provide no meaningful benefit," a White House official, speaking on condition of anonymity, said in a statement provided to Reuters. "The Trump administration is confident in its legal positions and looks forward to arguing -- and winning -- before the federal judiciary," the official added. While presidents often face legal challenges over policy initiatives, Trump’s administration stands out for the number of suits it has encountered so soon after taking power. Trump has faced far more litigation than Obama had at this stage of his presidency. A review of legal database Westlaw showed that in Trump’s first nine months in office, cities or states filed 24 lawsuits challenging major policy initiatives of the administration. The review showed no similar lawsuits during the same time period of Obama’s presidency. Trump also faces numerous suits by advocacy groups and others challenging such actions as his termination of an Obama program that protected people brought into the United States illegally as children from deportation and the authority of a presidential commission formed to investigate alleged voter fraud. 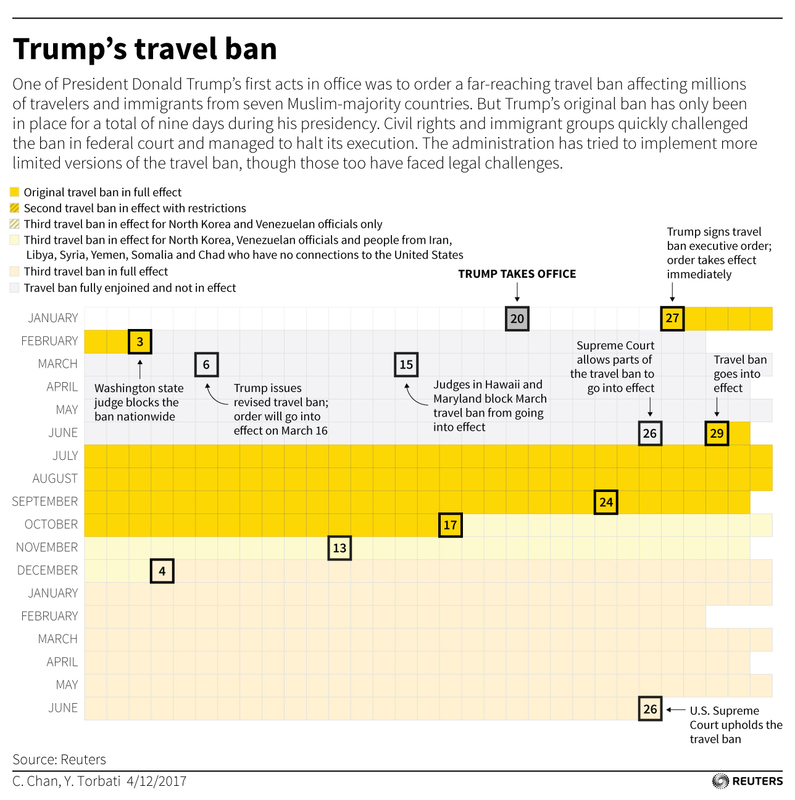 Trump has relied heavily on unilateral executive actions to advance his policy objectives. His fellow Republicans who control Congress have been unable to pass any major legislation he has sought. Executive actions can be challenged in court more quickly than lengthy federal rule-making procedures, said law professor Jonathan Adler of Case Western Reserve University School of Law. Obama relied on executive actions during the later years of his presidency after being unable to win congressional approval of key initiatives, and some of those actions drew legal challenges. But early in his presidency, he relied on unilateral actions less often because his fellow Democrats controlled Congress and passed major legislation including the 2010 Obamacare law. Some legal experts say the haste with which Trump drafted some of his policy initiatives may have helped those challenging the actions because the orders were not sufficiently vetted. “This administration is more willing to shoot from the hip” when compared with the Obama administration, Adler said. That is how San Francisco City Attorney Dennis Herrera, a Democrat, saw Trump’s executive order on sanctuary city funding, which Herrera calculated could jeopardize up to $2 billion in federal funds for his city. Herrera said he saw Trump’s action as “designed to appeal to a part of the administration’s political base without really having been vetted” by lawyers to ensure it was legally airtight. Herrera won an initial ruling in April blocking the measure, and the case is now pending before an appeals court. Trump’s actions have appealed to his conservative political base, while the legal challenges have pleased his liberal critics. Speaking at an event at New York University, Schneiderman, New York’s attorney general, called Trump’s first travel ban, signed in January just a week into his presidency, a “galvanizing moment” for Democratic officials. While lawsuits challenging the president’s actions have won some important early victories, the litigation onslaught’s ultimate effect on Trump’s agenda is not yet clear. Trump’s opponents have tended to file suits in jurisdictions where they think they are likely to prevail, and where appeals will be heard in regional federal circuit courts dominated by Democratic-appointed judges. The final decisions on the cases could be made by the Supreme Court, where Trump’s appointment of Gorsuch restored a 5-4 conservative majority. The high court is likely to “prove more receptive” to the administration’s arguments on issues like immigration, said George Washington University Law School professor Jonathan Turley. Last week, a federal judge in San Francisco who was appointed by Obama appeared skeptical in a hearing about the challenge by the 18 states to the Affordable Care Act subsidies, illustrating the limits of resistance through litigation. Alluding to the political aspect of the case, U.S. District Judge Vince Chhabria asked rhetorically during a hearing: why “have all these attorneys general rushed to court seeking an emergency ruling against President Trump?” Chhabria then ruled in favor of Trump.